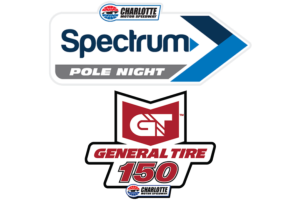 Spectrum Pole Night returns on Thursday, May 23, with three-round knockout qualifying to decide which Monster Energy NASCAR Cup Series drivers will “go” and who will “go home” prior to the legendary Coca-Cola 600 on Sunday, May 26. The Spectrum Pole Night excitement also includes the rising stars of the ARCA Racing Series presented by Menards battling it out in the General Tire 150. ARCA’s drivers will duel to see who joins the likes of famous names like Ryan Newman, Kerry Earnhardt and Adam Petty as ARCA winners at Charlotte. Don't forget, kids 13 & under get in FREE!